We pick up directly where the last issue ended, Col. Rick Flag had just opened fire and shot Amanda Waller, he says the bullet directly hit Amanda Waller in the head, and she falls dead on the ground. In reality, Kitana manages to intercept the bullet with her soul sword, and Amanda Waller stands stunned and surprised. She takes down Flag in short order by herself, and it becomes evident that there is something in the atmosphere that is causing everyone to act violent and irrational. In the mess hall, the guards turn on the Squad, as they taser Hack, who tries to explain that something was going on. Hack wakes up in the room where they install the Neuro-Bombs into the members of the Suicide Squad. She is strapped to the table, and is confronted by a corpse looking creature that resembles a lot like Captain Boomerang, she somehow manages to make him disappear as she panics. Over in the Lab, Harcourt mentions that Zod poses no trouble during this distress, as Kryptonians are powered by the yellow sun, and that they have the red solar lamps going, but one of the affected scientists switches the red sun lamps to yellow... And Zod wakes up! Finally, Harley Quinn is seen, straightening herself up, as it appears that whatever it is turning everyone crazy, has the opposite affect on her. Reverting back to Dr Harleen Quinzel, she walks right into the thick of things, leaving us with the final image, of Kitana creeping up behind her ready to behead her with the soul sword. Story - 5: This was an amazing issue. The suspense had me glued to each page... or rather the screen, as I read this digitally. I confessed last time around, that I spoke to soon, and should have let the story play out, instead of complaining about the elements that I felt hadn't been addressed yet... Again I have mud on my face, as I a few weeks ago I said that they had wasted a well known character like Captain Boomerang for a cheap shock moment... Well it appears that I could have been wrong about that also. I am man enough to admit it. Well done Mr Williams! I love the affects that the Phantom Zone is having on everyone. As if Zod's blood lust is seeping into everyone's psyche. Ironically I find it great that it is the very thing that makes Harley Quinn sane again... What I wouldn't give to have the Joker in the building too. I'd love to see what it does to him. This issue featured the first appearance of El Diablo in the main story of the book. Up until now, we had only seen him in specials and back up stories. I'm curious to see what role Zod will actually play. Up until now, he has been pretty much a berserker, tearing things up. I wonder how Waller will ultimately gain control of him... If she can. Hack is another character that has been an interesting to follow. It appears she has abilities that even she isn't totally aware of yet. We may have seen the end of June Moon, if Killer Croc carries through with biting her neck clean off. The psychological ramifications that Killer Croc will be left with could prove to be compelling reading. All in all, this series, though a little slow to start with, has been a fun ride, with a perfect marriage of writing and art. I have faith in Rob Williams. 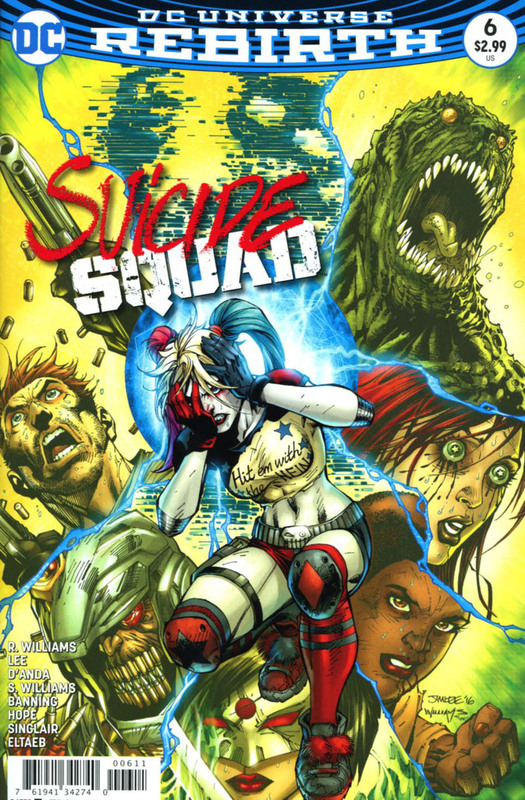 Also it makes me anticipate the upcoming Justice League vs Suicide Squad... I wonder what Superman will think... Or do when he finds out that Amanda Waller is in possession of one of his deadliest enemies. Art - 5: I must say that I truly am impressed that Jim Lee has managed to keep a bi-weekly schedule the way he has lately. And also provide top notch art. So far he has given us 6 consecutive issues, and hasn't seemed to slow down or let the art suffer. I loved the Harley Quinn page, where she cuts her hair, removes her make up, and assumes the look she sported as Harleen Quinzell. It seems almost like a reverse Bizarro transformation. I like the look that Lee gave El Diablo. He has a great handle on translating the film costumes and making their comic book interpretations. Lee along with Sandra Hope and Matt Banning join Scott Williams on the inking chores this time around. The art doesn't suffer from it at all. Good job team. And lastly I again must mention Alex Sinclair's colors. He is an important part of the art team. The book wouldn't look as good as it does without him. Cover Art - 5: The cover is generally the first thing that we look at when read a comic. So the cover to this issue had me mesmerized, as I focused on why Deadshot looked like a mutant. With bullets for teeth and fingernails. This cover is a perfect representation of what to expect inside. Awesome job again by Jim Lee. I love the composition. The Lee Bermejo variant of Captain Boomerang is very moody, and I wondered why they would put a dead character on the cover like this, after reading the issue, it was a smart choice.